Announced on the show floor of BGG.CON, Quadropolis is the next title from publisher Days of Wonder. Another entry into a crowded city-building genre, Quadropolis sells itself on the quality of its abstract puzzle gameplay, not its theme. Players fill their city by taking tiles from a 5x5 grid market, requiring them to send one architect to do so. Each architect is limited in what grid positions they can purchase from, though, and those restrictions carry over to further limit where players can place these new tiles in their own city. Add in a bit of resource management, and you've got a puzzle complex enough that it will force you to plan several moves ahead, while also paying attention to the moves of others. 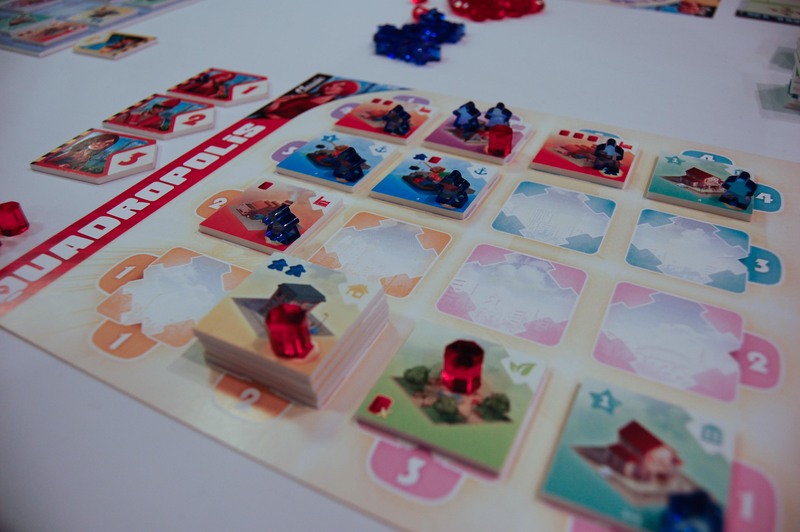 Quadropolis never felt overwhelming, though, as the game-long puzzle was broken down into manageable, bite-sized decisions, giving it the makings of a very successful casual strategy game. Another notable achievement for Quadropolis is that the two games included (normal and advanced modes) both feel distinct and complete, rather than one being a constricted or hastily-expanded version of the other. This plays well for Days of Wonder's customer base, as the publisher is eager for another accessible hit in the vein of Ticket to Ride. Previously seen in prototype form under the name City Mania, the newly-named Quadropolis was the first publicly-playable iteration of the game. It's undergone a graphic design treatment in line with Days of Wonder's typically lavish productions, and the choice for translucent plastic bits actually works quite well. Quadropolis is set for a worldwide release in March 2016.